While there, among the Penn Staters I caught up with was Malik Golden, who last played for the Nittany Lions in 2016 and has spent the better — and worst — part of the past two seasons on injured reserve for the Steelers. Golden had been through the wars at Penn State. He was the last recruit to verbally commit to Joe Paterno. He played two years for Bill O’Brien and three years for James Franklin, at wide receiver then at safety, where he had four position coaches. Suffered through four seasons of never more than eight wins. Then came 2016. And Joe Moorhead. What was that something? I asked him. That was coming from a guy who had been through it all at Penn State. Played defense. Was amply cynical. Yet Golden attributed Penn State’s run of 22-5 success in 2016-17 to Joe Moorhead. Since then, Penn State is 6-3. Before Moorhead, they were 14-12, giving James Franklin a 20-15 record at Penn State without JoeMo. Moorhead’s departure has had an impact not just on the 2018 offense, but on the squad overall — its confidence, its swagger, its old-young dynamic and its offense-defense locker room camaraderie. Moorhead believed. And not just in his offense. “A big part of that is, One, the offense Coach Moorhead brought in,” McSorley said before Penn State’s appearance in the 2016 Big Ten championship game. Moorhead had a special relationship with a lot of players, including wide receiver DeAndre Thompkins. The two had a weekly texting ritual that fueled and centered Thompkins, a quiet and thoughtful sort. 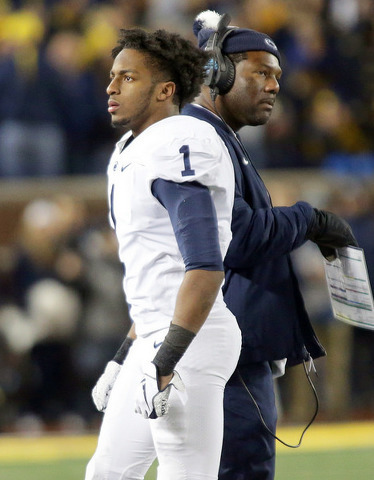 Clearly, in 2018 the Penn State coaches had lost faith in Thompkins, who had the fortitude and self-confidence to overcome it and return to a key role. It’s hard to believe that Thompkins — a fifth-year receiver averaging 15.8 yards per catch who was the nation’s No. 5 punt returner in 2017 — would have fallen off the radar screen if Moorhead had been around. Or Josh Gattis, for that matter. Now, flash forward to today: After a string of three losses in five games that has extended Penn State’s losing streak to the Big Ten East’s Big Three — Michigan, Michigan State and Ohio State — to 0-5, that belief is being challenged, if not in the locker room then among Nittany Nation. Moorhead turned over the keys to the RPO car to Ricky Rahne, and it seems clear that it in crunch time — against big-league teams and not the Kent States and Illini of the world — that Rahne is still getting adjusted to what was, in essence, a Lamborghini. Of course, the passengers are not the same — gone are Saquon Barkley, Mike Gesicki, DaeSean Hamilton and Chris Godwin — and that accounts for the offensive woes as well. In its stead, recently, is a Toyota Corolla. Functional for those drives against Indiana, but you can’t make it go in The Big House. The change is likely part players, part scheme, part opposition, part play-caller. And although Rahne, a former QB at Cornell who has coached the offense and occasionally quarterbacks with Franklin at Kansas State, Maryland and Vanderbilt, knows his football, the RPO was in Moorhead’s DNA. And not Rahne’s. We’re really not sure what offense he would like to run if given his own car, at Penn State or elsewhere. He stayed at K-State when Franklin left, but overall Franklin has been his boss for much of the past dozen years. Moorhead, the size of a well-fed tight end, not only commanded the Penn State offense. He also commanded the meeting room, the sideline and the practice field. And there’s no doubt during games in 2016-17, that Franklin would at least on occasion defer to Moorhead — a former head coach at Fordham with a 38-13 record — when it came to in-game decision-making with the offense. Rahne calls the plays from the press box and McSorley has said he is OK with that. But with Moorhead no longer on the sidelines, after a phone call upstairs to Rahne, McSorley is left to his own devices. As if the guy doesn’t have enough on his shoulders already. Often, if the QB coach and the coordinator are the same person and he is in the box during games, the quarterback will spend some serious time conversing with the head coach. Not so with McSorley and Franklin. (I always try to follow McSorley with my binoculars when he comes off the field.) Instead, McSorley frequently sits next to No. 3 QB Sean Clifford or young wide receiver Jahan Dotson on the bench, after a phone call check-in with Rahne. The QB's interaction with the HC is minimal. 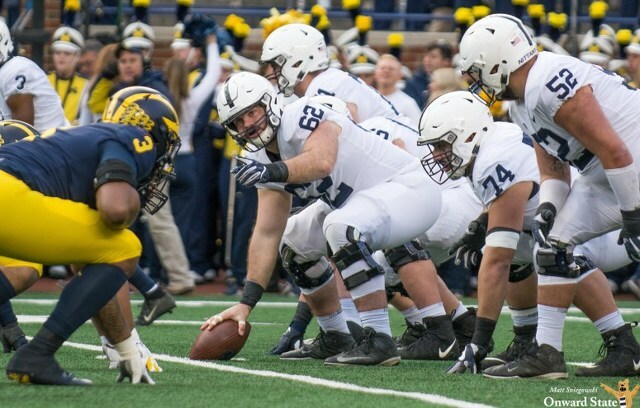 All of this may have led to the confusion on Saturday in Ann Arbor, when Franklin kept on flipping McSorley and Tommy Stevens in and out of the game. It seemed like there was no rhyme or reason, and afterwards the two quarterbacks said they were undaunted by it all. But one would think that if Moorhead — or Rahne — were on the sidelines, it would have been a much cleaner situation. The fun that until recently ruled the Penn State offense — home run swings and literally uplifting tosses of players to the blue and white skies — seems to have disappeared, along with the touchdowns. When it comes to the RPO and PSU, the passion has gone out of the relationship. Here’s what Chris Godwin, now with the Tampa Bay Buccaneers in the NFL, said in 2016 about that: “Coach Moorhead is very passionate. He’s a very passionate guy. We can tell that through all of our meetings. He can go from a very calm talking tone to really getting fired up as if we are going to play that day. That’s what we love about him. Each and every game he’s going to come out and call it to win. Over the past five games in 2018, against the meat of the schedule, the second half has been a particular thorn in Penn State’s side. The Nittany Lion offense has scored just 19 points in the third quarter of the past five games, beginning with Ohio State and ending with Michigan. That’s not a good indication of effective halftime adjustments. Led by Moorhead, the offensive staff in 2016-17 featured a braintrust that also included Gattis (now at Alabama), Huff (now at Mississippi State with JoeMo), Limegrover and Rahne. On Saturday, Michigan’s offensive coaches included well-respected veteran Pep Hamilton, who was an offensive coordinator in the NFL; Jim McElwain, a former head coach at Colorado State and Florida, and offensive coordinator at Alabama; and Ed Warinner, who was an offensive coordinator of some sort at seven schools, most recently at Ohio State. Not to mention head coach Jim Harbaugh, a former Michigan and NFL quarterback who led the 49ers to the Super Bowl as a head coach and now has a heavy hand with the Wolverine offense. Recently, the Penn State offense seems rudderless — and yes, in part because of McSorley's injury. At running back, it is seemingly just as confounding. Miles Sanders exploded for 162 yards against Michigan State, but in the other four games since Ohio State, he’s rushed for 43, 72, 62 and 14 yards — the 14 coming against Michigan on seven carries. And it’s not that he’s sharing the load with another running back. Take away McSorley and Stevens, and other than Sanders, only Ricky Slade (one carry vs. Michigan State, and like a punch to gut, MIA since) and Journey Brown (one carry each vs. Indiana and Michigan) have carried the ball. I get it. Other teams are on scholarship, too, and Barkley was a No. 2 pick and the Moorhead offenses at Penn State were populated with NFL-caliber wide receivers. But hasn’t Franklin been recruiting and developing top players in the meantime? And doesn't the starting five along the offensive line have a combined 19 years at Penn State? And maybe be a bit riskier on offense. Maybe run Hamler in some motion or give him a carry; he had just one touch from the line of scrimmage on Saturday. No wonder Hamler was ticked off in The Big House and he showed it. He didn’t see face-to-face with Corley, out there for the whole world to see on national television. Not good form. “I think Coach Moorhead has done an unbelievable job instilling confidence in all of the players and all the guys on the offense,” said Gesicki, the former Nittany Lion tight end who as Franklin has pointed out numerous times the past few weeks went through some trail and tribulations before Moorhead arrived. “It was something where we would go out there and we wouldn’t know if we were going to get that first down, we didn’t know if we were going to move the ball down the field. Penn State football’s clash with Wisconsin on Nov. 10 is set to kick off at noon in Beaver Stadium and be broadcast on ABC.